BIG PHARMA’S SEEDY SECRET HISTORY! In the 30’s, Morris A. Bealle, a former city editor of the old Washington Times and Herald, was running a county seat newspaper, in which the local power company bought a large advertisement every week. This account took quite a lot of worry off Bealle’s shoulders when the bills came due. But according to Bealle’s own story, one day the paper took up the cudgels for some of its readers that were being given poor service from the power company, and Morris Bealle received the dressing down of his life from the advertising agency which handled the power company’s account. They told him that any more such “stepping out of line” would result in the immediate cancellation not only of the advertising contract, but also of the gas company and the telephone company. That’s when Bealle’s eyes were opened to the meaning of a “free press”, and he decided to get out of the newspaper business. He could afford to do that because he belonged to the landed gentry of Maryland, but not all newspaper editors are that lucky. Bealle used his professional experience to do some deep digging into the freedom-of-the-press situation and came up with two shattering exposés — “The Drug Story”, and “The House of Rockefeller.” The fact that in spite of his familiarity with the editorial world and many important personal contacts he couldn’t get his revelations into print until he founded his own company, The Columbia Publishing House, Washington D.C., in 1949, was just a prime example of the silent but adamant censorship in force in “the Land of the Free and the Home of the Brave”. Although The Drug Story is one of the most important books on health and politics ever to appear in the USA, it has never been admitted to a major bookstore nor reviewed by any establishment paper, and was sold exclusively by mail. Nevertheless, when we first got to read it, in the 1970s, it was already in its 33rd printing, under a different label – Biworld Publishers, Orem, Utah. “The last annual report of the Rockefeller Foundation”, reported Bealle, “itemizes the gifts it has made to colleges and public agencies in the past 44 years, and they total somewhat over half a billion dollars. These colleges, of course, teach their students all the drug lore the Rockefeller pharmaceutical houses want taught. Otherwise there would be no more gifts, just as there are no gifts to any of the 30 odd colleges in the United States that don’ t use therapies based on drugs. Not the least of its holdings are in the drug business. The Rockefellers own the largest drug manufacturing combine in the world, and use all of their other interests to bring pressure to increase the sale of drugs. The fact that most of the 12,000 separate drug items on the market are harmful is of no concern to the Drug Trust. A compilation of the magazine Advertising Age showed that as far back as 1948 the larger companies in America spent for advertising the sum total of $1,104,224,374, when the dollar was still worth a dollar and not half a zloty. Of this staggering sum the interlocking Rockefeller-Morgan interests (gone over entirely to Rockefeller after Morgan’s death) controlled about 80 percent, and utilized it to manipulate public information on health and drug matters – then and even more recklessly now. In fact in the ’50s the Drug Trust had one of its directors on the directorate of the Associated Press. He was no less than Arthur Hays Sulzberger, publisher of the New York Times and as such one of the most powerful Associated Press directors. It was thus easy for the Rockefeller Trust to persuade the Associated Press Science Editor to adopt a policy which would not permit any medical news to clear that is not approved by the Drug Trust “expert”, and this censor is not going to approve any item that can in any way hurt the sale of drugs. This accounts to this day for the many fake stories of serums and medical cures and just-around the-corner breakthrough victories over cancer, AIDS, diabetes, multiple sclerosis, which go out brazenly over the wires to all daily newspapers in America and abroad. To teach the Rockefeller drug ideology, it is necessary to teach that Nature didn’t know what she was doing when she made the human body. But statistics issued by the Children’s Bureau of the Federal Security Agency show that since the all-out drive of the Drug Trust for drugging, vaccinating and serumizing the human system, the health of the American nation has sharply declined, especially among children. Children are now given “shots” for this and “shots” for that, when the only safeguard known to science is a pure bloodstream, which can be obtained only with clean air and wholesome food.Meaning by natural and inexpensive means. Just what the Drug Trust most objects to. In addition to the FDA, Bealle listed the following agencies having to do with “health” —. i.e., with the health of the Drug Trust to the detriment of the citizens —. 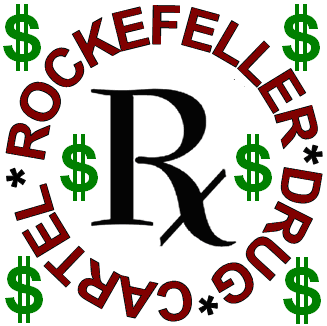 as being dependent on Rockefeller: U.S. Public Health Service, U.S. Veterans Administration, Federal Trade Commission, Surgeon General of the Air Force, Army Surgeon General’s Office, Navy Bureau of Medicine & Surgery, National Health Research Institute, National Research Council, National Academy of Sciences. The Lincoln Chiropractic College in Indianapolis requires 4,496 hours, the Palmer Institute Chiropractic in Davenport a minimum of 4,000 60-minute classroom hours, the University of Natural Healing Arts in Denver five years of 1,000 hours each to qualify for a degree. The National College of Naprapathy in Chicago requires 4,326 classroom hours for graduation. Yet the medico-drug cartel spreads the propaganda that the practitioners of these three “heretic” sciences are poorly trained or not trained at all —. the real reason being that they cure their patients without the use of drugs. In 1958, one of those “ill-trained” doctors, Nicholas P. Grimaldi, who had just graduated from the Lincoln Chiropractic College, took the basic science examination of the Connecticut State Board along with 63 medics and osteopaths. He made the highest mark (91.6) ever made by a doctor taking the Connecticut State Board examination. Rockefeller’s various “educational” activities had proved so profitable in the U.S. that in 1927 the International Educational Board was launched, as Junior’s own, personal charity, and endowed with $21,000,000 for a starter, to be lavished on foreign universities and politicos, with all the usual strings attached. This Board undertook to export the “new” Rockefeller image as a benefactor of mankind, as well as his business practises. Nobody informed the beneficiaries that every penny the Rockefellers seemed to be throwing out the window would come back, bearing substantial interest, through the front door. Medical colleges were instructed that if they wished to benefit from the Rockefeller largesse they had better convince 500 million Chinese to throw into the ashcan the safe and useful but inexpensive herbal remedies of their barefoot doctors, which had withstood the test of centuries, in favor of the expensive carcinogenic and teratogenic “miracle” drugs Made in USA, which had to be replaced constantly with new ones, when the fatal side-effects could no longer be concealed; and if they couldn’t “demonstrate” through large-scale animal experiments the effectiveness of their ancient acupuncture, this could not be recognized as having any “scientific value”. Its millenarian effectiveness proven on human beings was of no concern to the Western wizards. This was the description Ida Tarbell made of John D. Rockefeller in her “History of the Standard Oil Company”, serialized in 1905 in the widely circulated McClure’s Magazine. And that was several years before the “Ludlow Massacre”, so JDR was as yet far from having reached the apex of his disrepute. But after World War II it would have been hard to read, in America or abroad, a single criticism of JDR, nor of Junior, who had followed in his father’s footsteps, nor of Junior’s four sons who all endevoured to emulate their illustrious forbears. Today’s various encyclopedias extant in public libraries of the Western world have nothing but praise for the Family. How was this achieved? In the year when according to the current Encyclopaedia Britannica (long become a Rockefeller property and transferred from Oxford to Chicago), Rockefeller had “retired from active business”, namely in 1911, he had been convicted by a U.S. court of illegal practices and ordered to dissolve the Standard Oil Trust, which comprised 40 corporations. This imposed dissolution was to provide his Empire with added might, to a degree that was unprecedented in the history of modem business. Until then, the Trust had existed for all to see – an exposed target. After that, it went underground, and thereby its power was cloaked in security, and could keep expanding unseen and therefore unopposed. The miners —. mostly immigrants from Europe’s poorest countries —. lived in shacks provided by the company at exorbitant rent. Their low wages ($1,68 a day) were paid in script redeemable only at company stores charging high prices. The churches they attended were the pastorates of company-hired ministers; their children were taught in company-controlled schools; the company libraries excluded books that the Bible-thumping Rockefellers deemed “subversive”, such as “Darwin’s Origin of the Species.” The company maintained a force of detectives, mine guards, and spies whose job it was to keep the camp quarantined from the danger of unionization. When the miners struck, JDR, Jr., then officially in command of the company, and his father’s hatchet man, the Baptist Reverend Frederick T. Gates, who was a director of the Rockefeller Foundation, refused even to negotiate. They evicted the strikers from the company-owned shacks, hired a thousand strike-breakers from the Baldwin-Felts detective agency, and persuaded Governor Ammons to call out the National Guard to help break the strike. The worldwide revulsion that followed was such that JDR decided to hire the most talented press agent in the country, Ivy Lee, who got the tough assignment of whitewashing the tycoon’s bloodied image. That was the beginning of the cleverly worded medical reports on new “miracle” drugs and “just around-the-corner breakthroughs” planted in the leading news offices and press associations that continue to this day, and the flighty public soon forgot, or forgave, the massacre of foreign immigrants for the dazzling display of generosity and philanthropy financed by the ballooning Rockefeller fortune and going out, with thunderous press fanfare, to various “worthy” institutions. In the following years, not only newsmen, but whole newspapers were bought, financed or founded with Rockefeller money. So Time Magazine, which Henry Luce started in 1923, had been taken over by J.P. Morgan when the magazine got into financial difficulties. When Morgan died and his financial empire crumbled, the thorough Facelift[ed] House of Rockefeller wasted no time in taking over this lush editorial plum also, together with its sisters Fortune and Life, and built for them an expensive 14-story home of their own in Rockefeller Center —. the Time & Life Building. By founding and lavishly endowing his Education Boards at home and abroad, Rockefeller won control not only of the governments and politicos but also of the intellectual and scientific community, starting with the Medical Power —. the organization that forms those priests of the New Religion that are the modern medicine men. No Pulitzer or Nobel or any similar prize endowed with money and prestige has ever been awarded to a declared foe of the Rockefeller system. Another interesting revelation in the article of Time was that many years ago already Singer “was pleasantly surprised when Britannica approached him to distill in about 30,000 words the discipline that is, at its heart, the systematic study of what we ought to do.” So now we touch the subject of sponsorisation and patronage. They don’t always mean immediate cash but, more important, long-term profits. Many decades ago the Encyclopedia Britannica moved from Oxford to Chicago because Rockefeller had bought it to add much needed luster to the University of Chicago and its medical school, the first one he had founded. Peter Singer, “the world’s greatest animal defender” who keeps a door permanently open to vivisection and the lucrative medical swindle, gets millions of dollars free publicity thanks to the worldwide engagement of the Rockefeller Foundation and the media makers who are in no position to oppose it. From the article in Time we also learned that Singer’s mother had been a medical doctor in the old country, which could mean that little Peter started assimilating all the Rockefeller superstition on vivisection with his mother’s milk. This entry was posted in corruption, Medicine and tagged corruption, drug cartel, medicine, reusch, Rockefeller. Bookmark the permalink.